Our firm is busier than it has ever been, and we need to grow quickly to keep up with our demand. So I want to hear from transit planning professionals who’d like to be a part of it. If you’re not familiar with our firm, you can read about it here. This is not a specific job listing with a specific deadline. Instead, it’s a general notice of interest, which will lead to one or more hires whenever we find the right match and can make a deal that both of us are excited about. … have a track record of successful project management. This can be either in consulting or the public sector. … have over 2 years of marketable transport planning and/or policy experience. Direct network planning experience is ideal but adjacent experience (e.g. transport policy, wayfinding, multimodal planning, corridor studies) can be workable if you are strong on other factors. In any case, the key word is marketable. Your resume, as it stands now, must make you interesting to clients as a key part of a consulting team, and also show us you’re ready to handle a diversity of transit planning situations. … know a bit about our work and reputation, and are generally supportive of our approaches to things. Reading a bit of my book, or this blog (try the Basics category), or one of our recent reports (like this one), will tell you if that’s you. … can show strong experience with synthetic thinking. Synthetic means putting things together. It’s the opposite of analytic, which means taking things apart. Analysis skills are important too, but you thrive in situations where there are several criteria of success that can’t be converted into a single measure, so you need to come up with ideas that solve several problems at once. You also enjoy leading others through this kind of thinking, encouraging them to contribute solutions while keeping them on task. … are good at explaining and engaging. You’re good at public speaking and other interactive events, or think you could grow into that. Perhaps you aspire to do some of what I do, building a national and international reputation as an explainer, not just a technical expert. … can handle travel, much of it interesting. We are a national and international practice. Mostly our clients are all over North America, but we also have strong relationships in New Zealand and Australia, and are currently working in Russia and Iceland. I travel about 1/3 of the time (and that’s my limit). The more senior you are with us, and the more you want to grow into a role like mine, the more likely it is that you would too. It is an especially exciting time to join our firm, because we’re growing from a very small base, and that means two key things. (1) You will have a lot of influence on the firm’s next few decisions (I consult heavily with staff and love to delegate) and (2) you will have the opportunity to work on lot of different things. Compensation and benefits? For the right person, we will make the right deal based on your experience and salary history. If you are used to a government job, moving to consulting is almost always a step down in benefits, but often a step up in challenge and opportunity for advancement. If you’re already in consulting, we will be more likely to match your salary and benefit history, at least after 3-6 months. We prefer to hire a little low and then give steep raises in the first year; raises of over 20% in one year have been common for excellent staff. Deadline? As soon as possible, but if this post is still here, it means I’m still interested in hearing from you, because we may make decisions at any time, and we may hire one or several people. Obviously, we do not discriminate based on race, ethnicity, religion, national origin, gender, sexual orientation, gender identity, disability, or any other trait that would not be relevant to your success, and we encourage applications from across all of those dimensions of diversity. If you think this is you, and you’re interested, send me a resume, cover letter, and some samples of your best work (reports, images, audio, video) using the little envelope icon in the menu bar above. If you think this might be you, but you have questions, use the same email. Thanks for reading! Please spread the word! Hi Jarrett! I’ve read your book, and I love it! I could *definitely* see working with you at some point. In fact, the first thing I would do is fix a broken link on this page. 🙂 In the snippet “Reading a bit of my book,” you’ll see that “book” is a broken link. 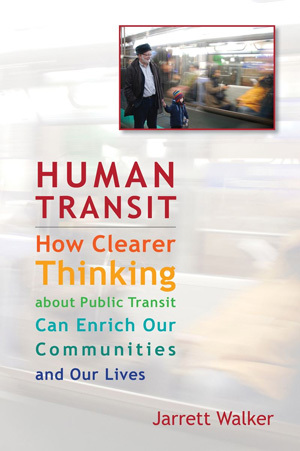 The link should instead be https://humantransit.org/book. We definitely need more people like you! There are a *million* things to do in Portland alone, and our elected officials (who are understandably far too busy, as well as unfortunately far too constrained by silos, to understand modern urban planning principles) need all the help they can get from folks who understand next-generation transportation planning, placemaking, the one and only correct order of prioritizing the five forms of transportation, the many important (and almost always missed or outright misunderstood) things needed to be done to actually attract *people* to public spaces, the counterintuitive advantages of prioritizing cars last, the dozens of mistakes that nearly all traffic engineers make all the time, how to build anti-fragile systems, the “greenspaces” folly, and literally hundreds of other incredibly important things that we need to be doing this very second to make our cities better for ALL types of people. Humble suggestion: Perhaps there could be a transit jobs page on the blog? I know that one of our product suppliers at work has a jobs blog page for the industry (not transit) I work in. In fact, I got my current job that way. With over 20 years in the public sector, working for both contractors and directly, I have been primarily in transportation planning and mapping with Geographic Information Systems and CAD. I hope you are looking for people willing to work remotely, or in the Boston MA/Providence RI southeast MA eastern RI area, or know people who are. Please feel free to reach out to me at abrody AT macmaps.com with any info on leads you might have. Thank you. Well, Jarrett, your bad advice has been adopted, and Wellington is now ripping out its trolleybuses in favor of polluting diesel buses. I, on the other hand, really hope your consultancy stops getting work, because dammit, you are *not* helping. I’d say that normally any consultancy is aimed to help finding the best solution to a specific multi-criterial problem under a certain set of constraints given. I by all means cannot agree on the fact that you may blame the consultant for any decision your city authorities make. Moreover, being a consultant myself, I’d like to note that, as it happens to be within any design process in the world, sometimes the decisions carried out after consultancy (and not necessarily due to or even considering what was delivered) may not be fully compliant with consultant’s values, whatever they are. The good consultant’s job is not to force in his values whatsoever, but to support the decision making process clarifying the trade-offs by executing a scientific analysis, accompanied by sharing experience and knowledge. Any decisions taken upon this information are still only responsibility of the decision makers, not the consultants. If you don’t like what your city administration does, it may be very well possible that your view of the problem, constraints and, eventually, values is not the same as the one authorities have. This is absolutely essential, and this is where you should definitely invite your city’s decision makers to a dialogue. In my advocacy experience, it has always been only a well-built dialogue and trustful professional environment that could help you to bring your values to the table and defend them. Hate speeches, on the other hand, are always useless.